How do you make your child eat vegetables? I found my answer with savory semolina muffin. Do you have some other alternates? While I am connected with many moms of the different age group of a child, they all find it challenging to make their child eat vegetables. Many moms confessed that their kids are mostly surviving on Noodles, burgers, and pizzas. Fortunately, as a child, I never had these options. I was observing my child for quite some time and realized that he has become picky in his choice of vegetables. 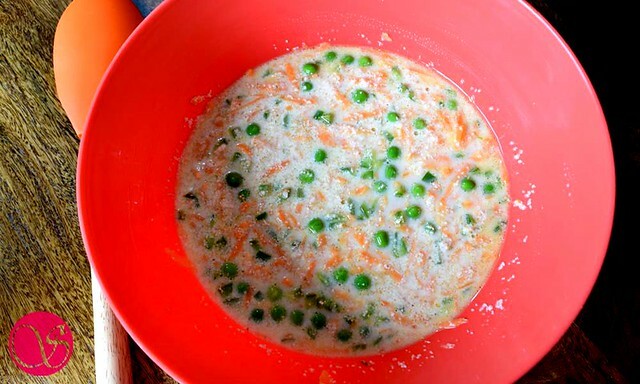 He has started removing peas from his vegetable and same is the case with carrots. A mother understands the importance of vegetables, however, kids don’t. Instead of vegetables, my kid loves muffins. Be it any muffin, he would simply grab one whenever he gets a chance. This was a lot of sweet intake and I was contemplating of replacing sweet muffins with savory muffins. Remember what I said in my article on developing healthy eating habits. I decided to kill two birds with one stone. This gave birth to the idea of savory vegetable muffins recipe. I just needed to decide on the base cereal for this vegetable savoury muffins. 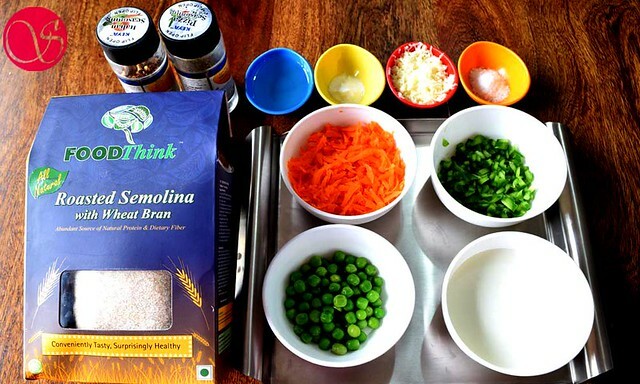 There also I made a healthy choice of picking semolina and crafted savoury semolina muffins. I keep my recipes egg free and same is the case with my eggless savoury muffins. Ok, before we get ready to make our healthy, eggless, vegetable savory semolina muffin, I need to tell you that I have used Roasted Semolina with Wheat Bran. I have given the buy link at the bottom of the Recipe. Wheat bran is a source of dietary fiber. It helps in preventing diseases like stomach and breast cancer, and gallbladder disease. It is also beneficial in treating constipation, high cholesterol, and high blood pressure. Wheat Semolina is typically a hard variety of Semolina. Digestion process of a human body takes time to break wheat semolina. Therefore, it keeps the hunger away for a long time and hence helps in weight loss. 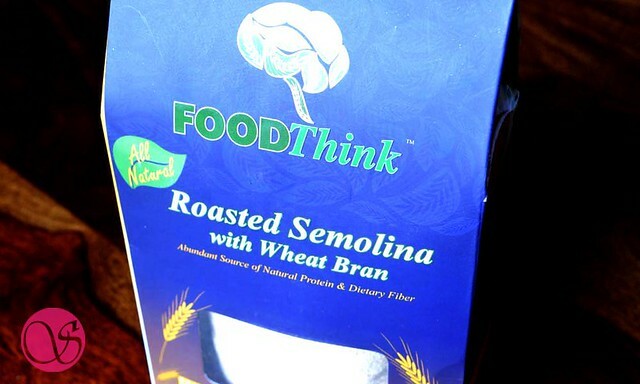 Semolina is a good source of selenium and iron. Selenium acts as an antioxidant and prevents oxidation of your cell membranes. As a result, the cell membranes stay healthy. Selenium also improves the immune system of your body. Iron, on the other side, helps increase in red blood cells. Furthermore, Iron in your diet helps the circulation of oxygen in your bloodstream. Institute of Medicine recommends a daily intake of 150 mg iron and 60 micrograms of selenium. Potassium in Semolina improves heart health. Good source of Vitamin B and Vitamin E.
Zinc, Calcium, and Magnesium in semolina help the nerves and reproductive system. Low glycemic index and recommended for diabetic people. 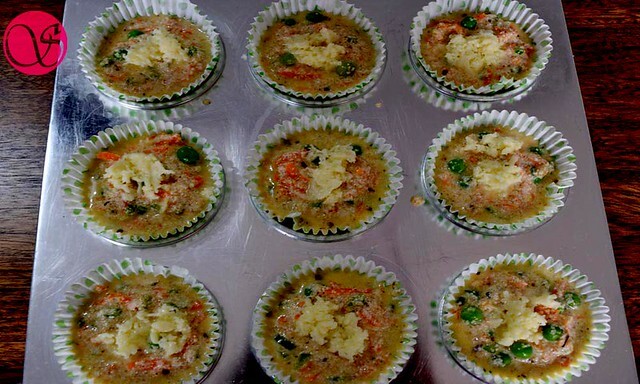 Finally, let us get down to recipe of Indian savory semolina muffin made of roasted semolina. In a large mixing bowl, add water, fresh yogurt/curd and whisk it well. Use only fresh curd as sour curd can make muffins taste sour. 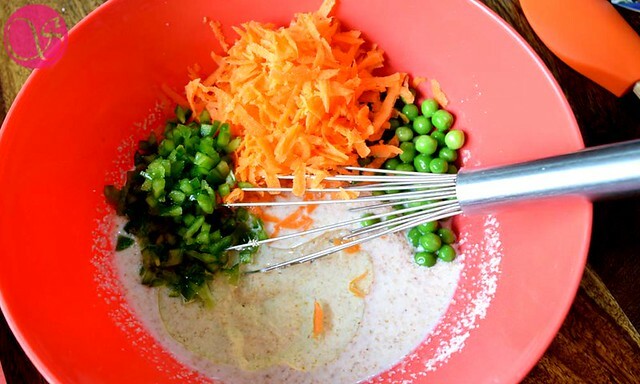 Add roasted semolina, oil, all the vegetables and prepare a smooth batter. You can add vegetable of your choice as well. 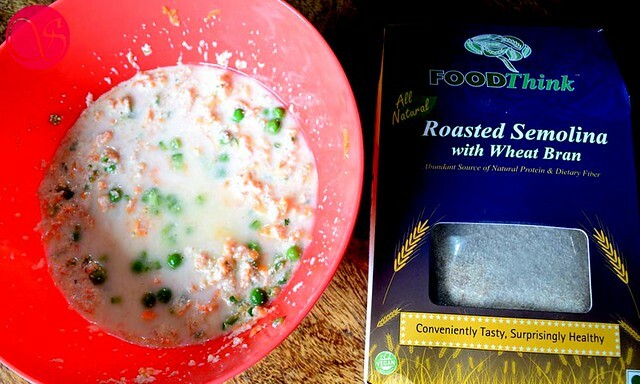 Actually, this is a wonderful way to make a fussy eater eat all the vegetables. Different color of vegetables will enhance the color of the final outcome as well. Initially, the batter will be runny. Do not make any adjustments to the liquid amount. Also, do not add more. Let the batter rest for 10 minutes. In the meantime, semolina will soak the moisture and will become soft. This will help to raise the muffins and will keep the muffins moist from inside after baking. Meanwhile, keep the oven for preheating at 180 °C. Stir the batter. Add salt, chili flakes, Pizza seasoning and baking soda to the batter. Mix everything well. The batter for savory semolina muffin should be of pouring consistency. Arrange muffin liners on a tray and fill each up to 2/3. Finally, sprinkle some grated cheese on top. Bakes these muffins in a preheated oven at 180 °C for 25 minutes or until they pass the toothpick test. If you want to make these muffins in Microwave convection or without an oven, check the notes in the recipe card. Once baked, take out the muffins from oven and let them cool completely before serving. Savory Semolina Muffin is ready. 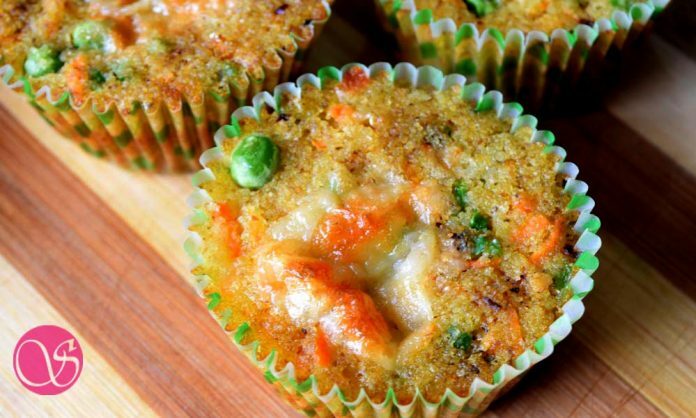 For those who have only believed in sweet muffins, try these amazing savory semolina muffins. 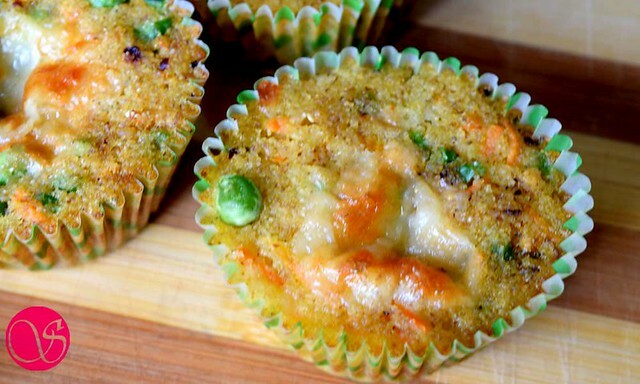 These vegetable savory muffins are great in taste and work best when you are on trying to lose those extra pounds. Completely Eggless and Healthy. 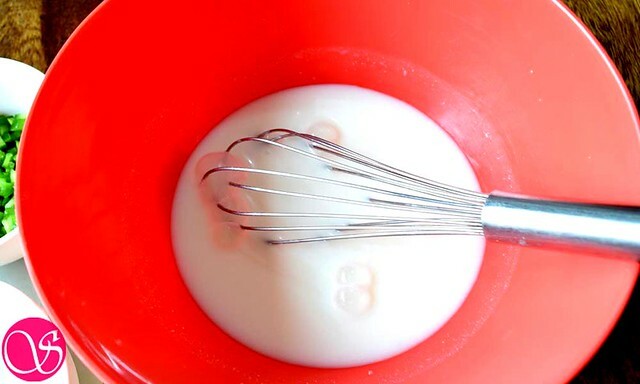 In a mixing bowl, add water, yogurt/curd and whisk it well. Add semolina, Oil and all the chopped vegetables. Batter will be runny. Let the batter rest for 10 minutes. During this time semolina will soak the moisture and become soft. Meanwhile keep the oven for preheating at 180 °C. Stir the batter. Add salt, chilli flakes, Pizza seasoning and baking soda to the batter. Mix everything well. If you feel the batter is too thick, you can add 2 tablespoons of milk. Arrange muffin liners in a tray and fill each upto 2/3. Sprinkle some grated cheese on top. Bakes these muffins in a preheated oven at 180 °C for 25 minutes. Once baked, take out the muffins from oven and let them cool completely before serving. Savoury semolina muffins are ready. Choice of vegetables can be yours. If you are adding spinach or mushroom then first saute these vegetables. To make these muffins spicier, add chopped green chilli. You can bake these muffins on Microwave convection mode at 160 degree Celsius for 20 minutes. 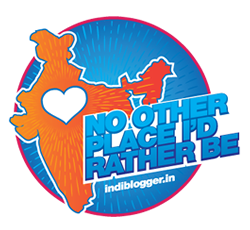 You can bake these muffins on gas stove as well using pressure cooker. For procedure please check my recipe Eggless vanilla cake. If after resting the batter for 10 minutes, you feel batter is too thick then add 2 tablespoon of milk to it.